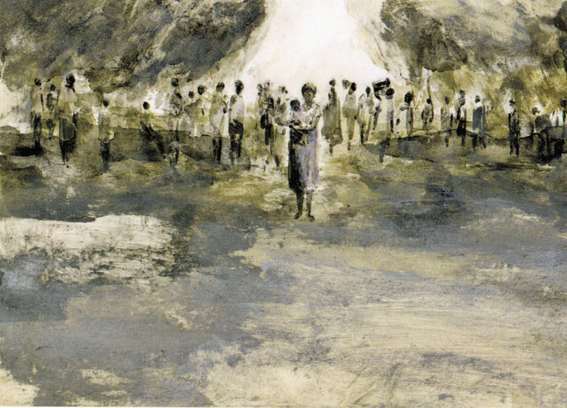 Five years in the making, Turquoise, a joint effort between Olivier Bramanti (artwork) and Frédéric Debomy (scenario) that revisits the 1994 genocide in Rwanda, is not a bande dessinée in the conventional sense of the term. The size of Turquoise (much narrower and slightly taller than a regular bande dessinée), the textured soft back cover, the high-quality paper, and Bramanti’s tempera paintings instantly distinguish this text from mainstream bandes dessinées. Indeed, the name of the publisher, Les Cahiers dessinés [Illustrated notebooks], provides a more accurate description of the format of Turquoise as the text more closely resembles an artist’s book rather than a standard “48 CC” bande dessinée. 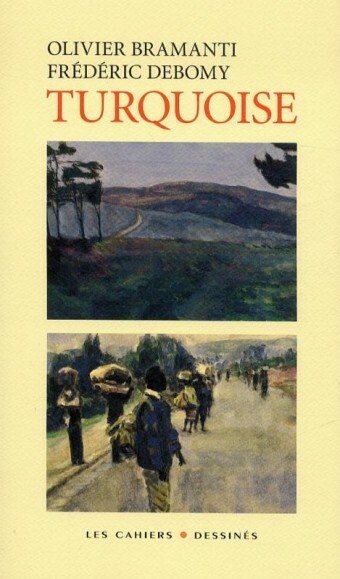 In this regard, the title, being the middle ground between blue and green, can signify the ambiguous classification of the text itself—not quite a bande dessinée—in addition to simultaneously referring explicitly to the ostensibly humanitarian French-led effort Operation Turquoise and symbolically representing the psychological gap between the victims and perpetrators of the genocide as Jessie Bi aptly points out. This metaphor of in-betweenness suggested by the title, when applied to the text more broadly, provides useful insight into the verbal and visual narrative strategies of Debomy and Bramanti. Most immediately, the text is visually dominated by Bramanti’s paintings of the landscape in which the ratio and representation of the blue sky with the verdant rolling hillsides—iconic images associated with Rwanda—vary with changes in mood. In addition, Debomy and Bramanti make narrative use of the space in between each of the images. While the thick white margins of the page generally direct our attention to the meaning of the images and the text accompanying them, there are many moments of silence as well in the form of images without text and also in completely and almost completely blank pages. This strategy effectively turns up the volume of silence and the non dit or the unspoken and at the same time draws attention to the difficulty of representing an admittedly delicate subject matter. For, as Debomy explains in the afterward entitled, “Le genocide des Tutsi du Rwanda et l’Opération Turquoise,” writing about recent history is difficult. Nonetheless, it is also necessary to which the labored production and subsequent publication of this text attest. In an attempt to make sense of this recent history, Debomy and Bramanti focus on the complicated reality of France’s involvement in the genocide as epitomized by the simultaneity of Operation Turquoise’s humanitarian efforts and its geopolitical underpinnings. This bifurcated undertaking initiated by then French President François Mitterrand—on the one hand openly praiseworthy and on the other hand surreptitiously politically driven—ultimately became the lens through which the international community was made aware of the genocide. However, as this text makes explicit and tries to undo, the images of the genocide that began circulating as a result of the descent of Western journalists on Rwanda with Operation Turquoise were quickly engulfed by the narrative of a humanitarian crisis developing in the refugee camps in the eastern region of Zaïre (now the Democratic Republic of the Congo) due to the outbreak of cholera, ultimately silencing the atrocities and scale of the actual genocide. To emphasize the dual nature of Operation Turquoise and to problematize the Western media’s representation of the genocide, Debomy constructs a narrative around the handful of repeated images broadcast internationally of the French troops’ arrival in Rwanda and what they witnessed. Not surprisingly, Debomy’s narrative oscillates between fact and fiction to immerse us in a deeper understanding of what took place before Operation Turquoise as well as after its implementation, thus providing the unsettling context of the genocide that the repetitive media images succeeded in stripping away. To complement this oscillation at the visual level, Bramanti’s imagery and style shift between a more representative mode and more evocative mode. For example, at one point we are presented with some of the now iconic images of the genocide that circulated in Western media at the time of Operation Turquoise; Bramanti’s style accordingly becomes more detail-oriented to re-present the actual screenshots of footage and photographs of the time. Conversely, at other times, Bramanti deploys repetition and variation to evoke a specific tone and to activate an emotional response. 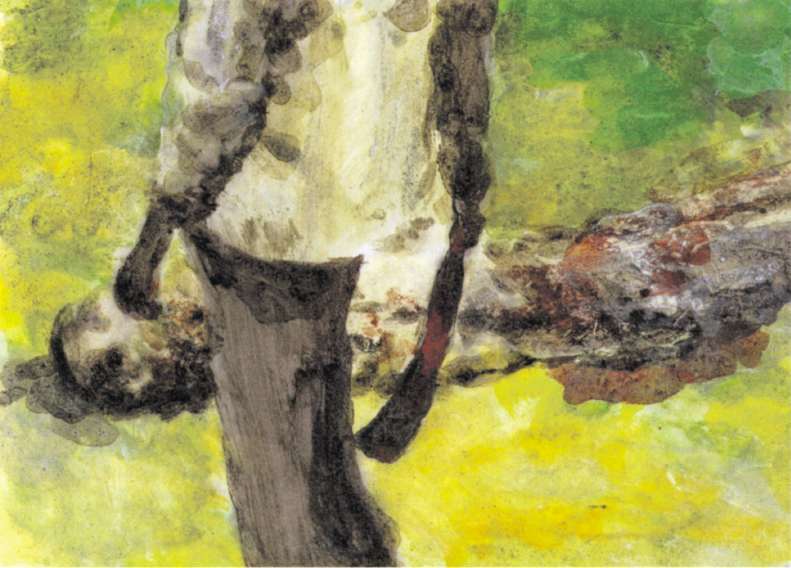 One striking example of this can be seen in this image in which the horizontal body of a victim on the ground is juxtaposed and bisected with the vertical body of a genocide perpetrator in the foreground. The framing of the victim occurs three times over the course of two pages with the perpetrator in two of the frames; each time, Bramanti’s rendering of the figures and their environment changes, becoming ever more in focus and culminating in the image seen here. The repetition and variation of these images—presented without text—provoke a reaction and inhibit us from simply passing over the reality of the genocide. Ultimately, Turquoise exposes the devastation of the genocide beyond the media-driven focus on the health crisis of the refugee camps and thus invites us to take stock of what we think we might know about the genocide. Moreover, it foregrounds the interplay of truth and lies at the heart of discourse about the genocide. To that end, the text is almost completely devoid of proper names. Interestingly, while the main character, a genocide survivor, is only referred to as elle [she], her captor Ferdinand, a neighbor who becomes a participant in the genocide, is the only character identified with a name. Similarly, the text avoids the use of actual terms for nationality and ethnicity, thus hovering between the universal and the specific, all while pointing directly to the political and ideological weight of certain terms. This delicate balancing act is characteristic of the entire text and demonstrates the subtle efficacy of Bramanti and Debomy’s efforts. 48 CC is an industry shorthand that describes the standard printing format of many mainstream bandes dessinées in which 48 refers to the number of pages and CC stands for cartonné [hardback] and en couleur [in color].